Fudge, Hershey kisses, cookies and moms all seem to go together perfectly, don’t they? Add all these things together and you get one, super-simply, yummy cookie that will be ready in minutes! where does the mom come in? She serves those cookies to her kids and hubby — of course! Just to prove that cookies, moms and kisses all go together, listen to this TRUE story that happened in my kitchen the other day. Now, I was not baking cookies that day. I was making pizza nachos and totchos. So, just remember that before we start this true life story. Everyone was buzzing around. Some kids were doing school, others were helping get lunch prepared. “Can you grab three cookie sheets, please?” I asked. “Sure!” she quickly headed to the dish pantry. Her youngest sister followed behind her, determined to help. “Mommy’s going to make cookies, Charity.” my four-year-old stated matter-of-factly. “No, Mary-Lynn. Mommy is making nachos.” Charity replied. Mary-Lynn just walked away in frustration. In her mind, cookies and moms just go together and moms ALWAYS bake cookies on cookie sheets. Love those special kid moments, don’t you? If you haven’t noticed, I am really enjoying this cake mix cookie thing. If you haven’t tried cake mix cookies, you should start. It is so simple. Very little measuring or grabbing ingredients out of your pantry. I make everything in one bowl, quickly roll the dough into balls and bake! Cookies only need to bake for 8-10 minutes and my kids often eat them before that are completely cool. But, hey, warm cookies taste better anyway! I love how home-made (or semi-homemade) cookies make my home smell. I feel like I need to throw on an apron and stir the fire! It just seems so cozy and just plain wonderful. We keep our oven running weekly to fill the kitchen with delightful smells. Yesterday we baked quiche and gluten-free, peanut butter banana bread. Look for those recipes soon, as I am always snapping pics when we have a baking day! If you don’t think you have time to bake homemade cookies, then cake mix cookies are perfect for you. Seriously, it takes less time then most of us spend on Facebook. Just pour, stir, roll and bake. Preheat oven to 350 degrees Fahrenheit. Mix all ingredients, except Hershey kisses in large bowl. Mix thoroughly with wire whisk, fork or electric mixer. Chill for a firmer dough. If you’re impatient like me, just gently roll into balls and place on parchment lined cookie sheets. Bake for 8-10 minutes. 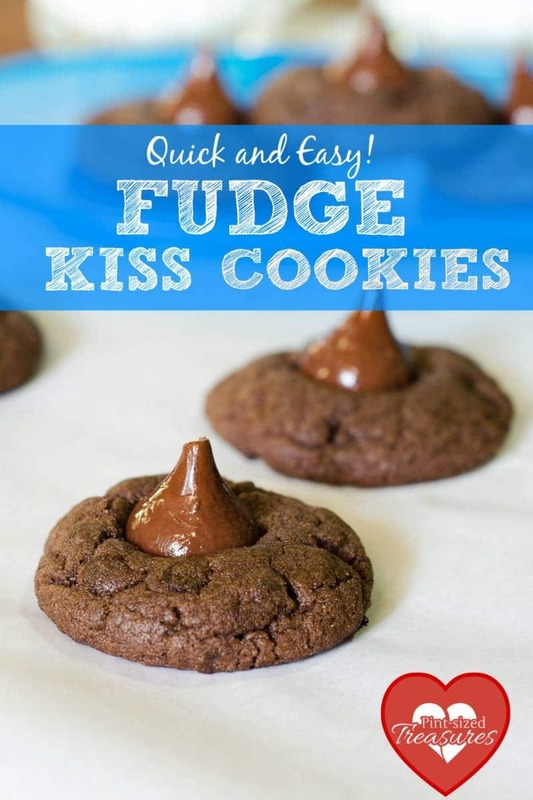 Immediately after removing cookies from oven, place kisses on top of the cookies and gently press into the cookie. Let cookies cool before serving. (though my little cookie monsters always snag some while they are warm!) 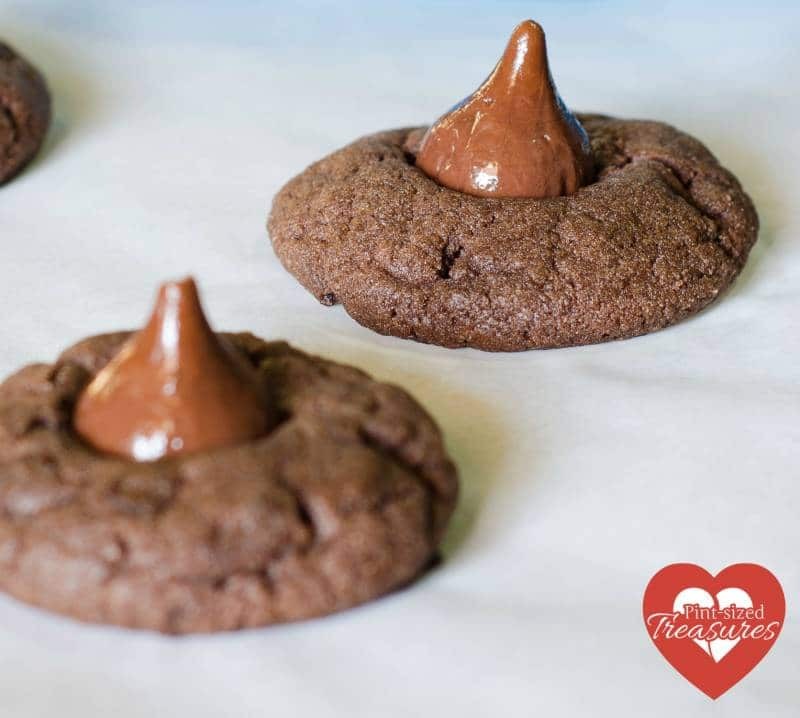 Yields: 24 Fudge Kiss Cookies.